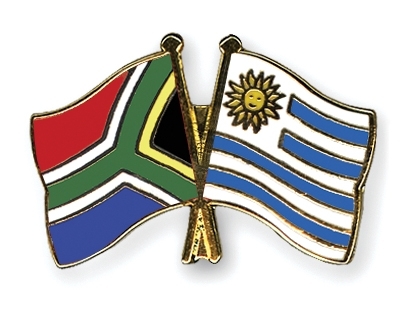 The above illustration shows a Crossed Flag Pin with the South-Africa flag on the left and the Uruguayan flag on the right. Friendship Pins are also available in the reverse grouping of flags: the Uruguay flag on the left hand side with the South-African flag next to it. Small badges often speak louder than big words. Crossed Flag Pins: South-Africa-Uruguay, size approx. 22 mm, hard-enamel, gold-plated, with butterfly clutch, in individual packaging. Our Crossed Flag Pins - symbols of solidarity with a powerful message! Please also check out our Special Offer, these crossed flag pins are available from stock and there is no minimum order quantity. Why not contact us? - We would be happy to advise you! All graphics, illustrations or photographs reproduced on the www.crossed-flag-pins.com domain are copyrighted. Individual files, gif animations or jpg data may be downloaded free of charge, be reproduced on the internet or be made publicly available. Please set up a link to https://www.crossed-flag-pins.com as an indication of the source.